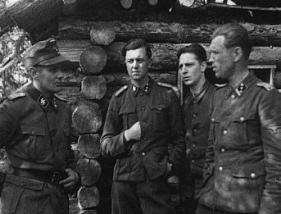 The subject of Norwegian volunteers in the Wehrmacht and SS has already been studied for years. This will be a very short version of the complex topic. Quisling, however saw this as a rather disappointing number, as he had visions of about 50,000 proud Norwegian soldiers, but one should bear in mind that "only" 11,000 volunteered to serve with the Allies, mainly the British. The Norwegian Police formations in Sweden, or the Merchant Navy sailors are not included in this number. About 1000 Norwegians were killed in combat, or died in Soviet POW camps. Most Norwegians volunteered for the Waffen SS, but some did try their luck in the Luftwaffe, or the Heer, Kriegsmarine, NSKK, Organisation “Todt” etc. - Disappointment with the Norwegian armed resistance during the German invasion, and the political circumstances that allowed such a weak and outdated defence policy. - Disappointment with the King and Government going into exile in the UK, and the feeling of have being betrayed by the British and French during the German invasion. - The fact that Norway had capitulated, and this was seen by many as the only way to re-build a new national army. Of course, many that joined were convinced nationalists, and believed in its international movement. Most were members of the right wing Nationalist party in Norway, ”Nasjonal Samling” (NS-National Unity), and a few were recruits from the Norwegian SS. However, a remarkable number of volunteers were amongst those who had fought the Germans during the invasion, and many were officers. Quisling gave orders on the 9th April 1940 that no NS member should participate in the armed resistance against the Germans, but most ignored this order, among them his own “Minister of Defence”, Maj. Ragnvald Hvoslef. However, small and inexperienced German forces as it turned out, conquered Norway with minor losses. ”Inevitably, any reasonable answer to this question must address the severe disadvantages under which the Norwegians had to fight, factors that resulted from both the long-term neglect of the armed forces over the preceding twenty years and the more immediate circumstances leading up to 9 April 1940. After taking these things into account, one cannot help but admire the skill and determination that many Norwegians displayed in their struggle to repel the invaders. Many of the ones that volunteered for the Germans had been of the few military formations engaged in fighting them just a year ago. Well-known men like Jonas Lie, Orvar Sæther and Olaf Lindvig fought in the Norwegian lines. (Front Fighter badge) Facsimile signature by Quisling. One must realise that there were actually no real Norwegian units fighting for the Germans. Even If the names were Norwegian, like ”Wiking”, ”Nordland” or even ”Norge”, these elements formed part of the German order-of-battle. This caused discontent amongst the volunteers, who expected to, and wanted to be in a purely Norwegian unit. The relatively low number of volunteers from Norway also made it difficult to fill a regiment-size formation entirely with Norwegians. We now examine the best known elements in which Norwegians served, starting with Waffen SS. The recruiting of Norwegians for this formation started on the 12/1-41. SS-PzDiv Wiking consisted of three Standarten (regiments): “Westland” for the Dutch and Flemings, “Germania” for Germans and Volksdeutsche, (ethnic Germans), and “Nordland” for Nordic volunteers. The officers and NCO´s were mostly Germans. Totally, in the first days, the division had a strength of 19 375 men, with about 950 vehicles, and they were at first led by the famous SS-Gruf. U. Gen.Lt. d. W-SS Felix Steiner. At the time the first Norwegians arrived, Germany was not at war with the USSR. The Norwegians strongly disapproved of this situation, as they wanted to stay together as a closed Norwegian element. For instance, Fredrik Jensen, the only Norwegian to ever get the German Cross in Gold, commanded ”Germania” in periods. He commanded a platoon in 7. Kompanie, Reg ”Germania”, and later the whole company. “Wiking” advanced and attacked Rostov and Tarnopol, and moved towards Caucasus. There were huge Norwegian casualties, but Wiking was regarded as a élite formation, and always participated where the battle was at hardest. "Wiking" advanced as far as Baku, but as early as in 1943, there were only 320 Norwegians left. When "Wiking" was finally destroyed in the vicinity of Vienna in ´45, only a handful of Norwegians were left in the formation. This Regiment was formed 9/3-43. 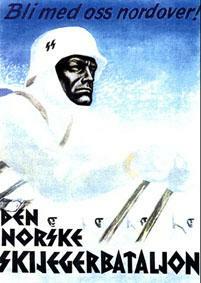 Many volunteered from ”Den Norske Legion” (DNL), and about 700 Norwegians were in the barracks and training grounds. Others in this unit, were Hungarians - Volksdeutsche. Apart from ”Norge”, there was PzGrenRgt ”Danmark”, with about 1150 Danes. Two other elements were also attached, a company from ”Germanske SS Norge”, led by Hauptsturmführer Olaf T Lindvig, the acting staff chief of GSSN, and a Pionier-Kompanie led by Reidar Hoel. Again the number of Norwegians was disappointingly low, as Quisling had expected 3500 men to volunteer. The men received very good and tough training, and being in this high-quality regiment suited everyone who wanted to build a professional career as a soldier or officer. At first, the Division was in the Balkans, mostly in Croatia, and participated in guard duties and anti-partisan warfare. In December 43 the division, minus their tank battalion, was sent to Oranienbaum near Leningrad, to lay siege to Russian forces remaining there. Originally, this unit was promised to be a fully Norwegian one, with Norwegian uniforms, weapons, language and officers. Of course, this never came true. The uniforms were standard SS, but most men used the Norwegian Lion instead of the SS runes. Members of NS wore the Raven and St.Olav Cross on the sleeve, and all men on the upper arm also wore a Norwegian flag. The main purpose of DNL was to fight in Finland, but this never happened. In December 41, 1900 men had volunteered; however of the 900-1000 accepted, about 20 were more than 50 years of age! DNL was organised as a reinforced battalion, and according to Frode Halle, the total strength after basic training was about 700 men. Most officers were Norwegians, and many saw this unit as the real beginning of a New Norwegian national army. Many of the volunteers did not accept the strong German influence, and left DNL – especially after it turned out that they were to participate in the siege of Leningrad instead of going to Finland. DNL was never; as seen by the Germans, a first class combat battalion, but it was suited to the static warfare in the trenches by Leningrad. DNL remained in Leningrad until spring 43, and had at least 180 casualties. Back in Norway, both the N.S party and G.S.S.N had problems in maintaining their organisations, since so many prominent members served at the front. 1.SS und Polizeikompanie, led by GSSN leader, Jonas Lie, was soon attached to DNL. In 43, DNL was disbanded, but the bad experiences in the co-operation with the Germans, caused severe problems with the recruiting of Norwegian volunteers later, in fact for the rest of the war. 4. SS and Police companies were formed from Norwegian policemen. A special order was awarded for front line combat service, the ”Jarnkross”, (Rikspolitiets hederstegn). 1.Kompanie was lead by GSSN chief, and Police minister Jonas Lie. It was attached to DNL in 42-43. Its strength was about 160 men. It was withdrawn spring 43. 3. Kompanie was lead by Aage Henry Berg, and received basic training in April 1944. It was also sent to Finland to form the 3. Kompanie of Schijäger-Batallion ”Norwegen" but reached their unit just in time to join the Lapland Army in its withdrawal. This was the only Norwegian unit never to have lost a man in combat. Back in Norway, It was split up in 10-12 ”Jagdkommandos”, and operated in Northern-Norway. Strength: 200 men. 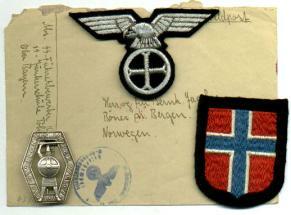 A very rare pair of collar patches as worn by an SS-Scharfuhrer in one of the Norwegian SS-& Police Companies. Not to be confused with the patch to DNL that had a lion faced to the right. The Skijägerbatallion was originally a company, and was a part of AA 6 / 6. SS-Gebirgsdivision ”Nord”. Led by Gust Jonassen, who was a Sports Leader in NSUF (The NSUF was the Norwegian equivalent of Hitler Jugend). When he was killed, Frode Halle succeeded him. It became a battalion in late 43. It was intended to be a purely Norwegian unit just like DNL, but its mission was completely different. SS-Skijägerbtl ”Norge” mostly consisted of well-trained skiers and the unit was used for long-range patrols (sometimes lasting for weeks), ambush, and combat patrols. Regarded by Germans as an élite unit, they were mostly led by Norwegian officers and NCO´s. Photo scanned from a book by Arneberg. Many Norwegians from other units, amongst them SS PzGrenRegt ”Norge” volunteered, and were transferred to this battalion. The strength was about 700 men in the beginning of 1944, and 1200 at the end of the same year. They were organised in three light platoons, each of three squads. Each squad had one MG, and two sharpshooters. There was also a mortar group. Submachine guns, including those of Czech manufacture, were very commonly in use, and out of the nature of their mission, only between 20% and 30% carried the M98K rifle. French shrapnel handgrenades were also widely issued. This unit suffered severe losses at the hills of ”Kaprolat” and “Hasselmann” when a Soviet regiment, the 731 Infantry Regiment, attacked these positions, then manned by about 300 men. The casualties are reported at between 141 – 182 killed or missing. Only a few were to escape, and soldiers from this unit are known to have been in Soviet imprisonment until 1955. The remains of this battalion were reformed as SS-Panzer-Grenadier-Battalion 506 in Oslo, with Frode Halle as its commander. They were also the last (and only) armed Norwegian SS unit stationed in Norway, now acting as Quislings lifeguard together with a few Hird men. This rather infamous formation was in fact the only pure Norwegian unit within the ranks of SS ever. Its duty was mostly to serve as concentration camp guards, and the ones serving were either former Frontfighters, or older NS members too old for front line service. The training grounds were at Holmestrand. A total of about 360 men served in the battalion, and served as KZ-guards, mostly in Northern Norway. Norwegians used standard SS equipment, but some adopted items that did not comply with German regulations. Norwegian pre-1940 medals and badges were allowed to be worn. Some Norwegian insignia, like sleeve cuffs, collar patch lions and NS sleeve emblems were also common in certain units. Norwegians served in a surprisingly large number of different German units, ranging from SS Standarte ”Kurt Eggers” (Propaganda and recruiting) to ordinary Heer units. About 450-500 Norwegians served as individuals, or small groups, which was a low number when one considers Norway’s fame as a seafaring nation. Norwegians are known to have served on ”Schlesien” and ”Lützow” in the Baltic Sea, amongst them Oscar Bang, a former officer in the Norwegian Navy. Suggestions were made to make a National Shield (“Ärmelabzeichen”), but it most likely never happened. Ole Henderson Blom, whose parents were residents in the US, led the recruiting and education of officers. About 350-400 women served as front line nurses, and at least 13 were killed in the front lines. Mrs Anne Moxness is the only non-German woman to ever receive the Iron Cross. Frontsisters were deployed in pairs, and those older than 21 years mostly served in Finland, the Baltic States, Soviet, Poland, Croatia, Italy, France – and Norway. The younger ones were sent to serve in Germany. Norwegians served in non-military units as well, such as “Germansk Landtjeneste”; this organisation can be compared to “Organisation Todt”. Members of “Germansk Landtjeneste” usually served in Germany, France or Italy, mostly for a year. Norwegians are known to have been in NSKK, as well as the NS organisations “Hirdens Bedriftsvern” and “Hirdens Alarmenhet”, but these two formations were purely Norwegian, and only used for guard duties. Some escaped to South America or Spain, mostly by boat. Among them was Sophus Kahrs, platoon commander from the “Skijegerbataljon”. Frontfighers were also denied citizen rights for years, and only a few have actually come out in to the open and admitted to their war time service in the German armed forces. 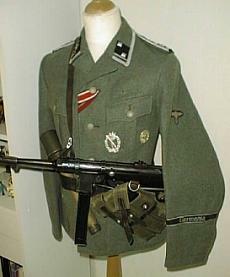 A nice collection of Norwegian Waffen-SS items.